Despite the rapid development of medical science, the diagnosis of lung cancer is still quite challenging. Due to the ultrahigh detection sensitivity of surface-enhanced Raman spectroscopy (SERS), SERS has a broad application prospect in biomedicine, especially in the field of tumor blood detection. Although Raman spectroscopy can diagnose lung cancer through tissue slices, its weak cross sections are problematic. 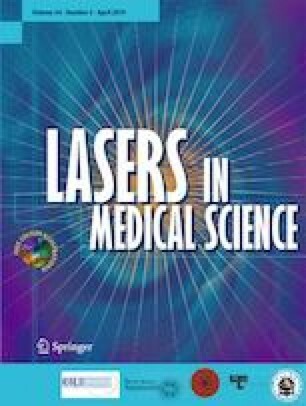 In this study, silver nanoparticles (AgNPs) were added to the surface of lung tissue slices to enhance the Raman scattering signals of biomolecules. The electromagnetic field distribution of AgNPs prepared was simulated using the COMSOL software. SERS obtained from the slices reflected the difference in biochemical molecules between normal (n = 23) and cancerous (n = 23) lung tissues. Principal component-linear discriminate analysis (PCA-LDA) was utilized to classify lung cancer and healthy lung tissues. The receiver operating characteristic curve gave the sensitivity (95.7%) and specificity (95.7%) of the PCA-LDA method. This study sheds new light on the general applicability of SERS analysis of tissue slices in clinical trials. The online version of this article ( https://doi.org/10.1007/s10103-019-02781-w) contains supplementary material, which is available to authorized users. This work was supported by the National Natural Science Foundation of China (11774208, 11674199, and 11604040), Shandong Province Natural Science Foundation (ZR2018MA040, ZR2017BA004, ZR2016AM19), China Postdoctoral Science Foundation (2016M602716). The sample collection was approved by the medical ethics committee of Qilu Hospital of Shandong University.